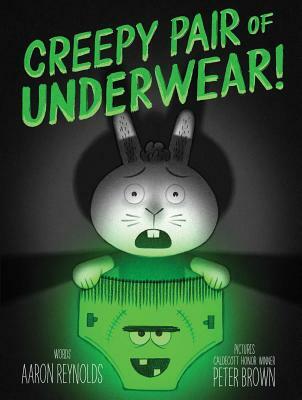 From the celebrated team behind Creepy Carrots!, Aaron Reynolds and Caldecott Honor winner Peter Brown, comes a hilarious (and just a little creepy) story of a brave rabbit and a very weird pair of underwear. Jasper Rabbit is NOT a little bunny anymore. He's not afraid of the dark, and he's definitely not afraid of something as silly as underwear. But when the lights go out, suddenly his new big rabbit underwear glows in the dark. A ghoulish, greenish glow. If Jasper didn't know any better he'd say his undies were a little, well, creepy. Jasper's not scared obviously, he's just done with creepy underwear. But after trying everything to get rid of them, they keep coming back!